Panic has gripped the Jubilee Coalition headed by Uhuru Kenyatta as details unravel on how the 2013 Presidential Elections were manipulated to hand him a win by the Independent Electoral and Boundaries Commission – IEBC, that is now the subject of a Supreme Court petition. The emerging details point to a shocking scheme hatched by circle of advisors and government functionaries within the intelligence and civil service, way before the elections. Analysts scrutinizing documents ahead of the Supreme Court petition by the Coalition for Reforms and Democracy challenging the results, were stuck by how technology was also used to aid Uhuru “defeat” Raila Odinga of CORD. “Kenyans can remember well that some curious things happened with regard to the so called provisional results that IEBC kept churning out”, says one of the lawyers handling the CORD petition. “It was a statistical impossibility. Between March 4th – March 7th, Raila Odinga was consistently stuck at 43/44% while Uhuru stayed at 53%. Musalia was stuck at 2.8% while the margin between Uhuru and Raila remained at 600,000-700,000 votes. This was impossible considering that results were coming in randomly from all over Kenya. Yet these figures remained consistent”. After a confusing Friday 8th March when IEBC postponed announcement of final constituency results till Saturday, a quick operation was put in place to force acceptance of the results, amidst anxiety by Kenyans that the voting process had been manipulated. IEBC’s James Oswago reportedly called media houses late in the night for a surprise final announcement of constituency results Friday 12.30am without indicating who had won. 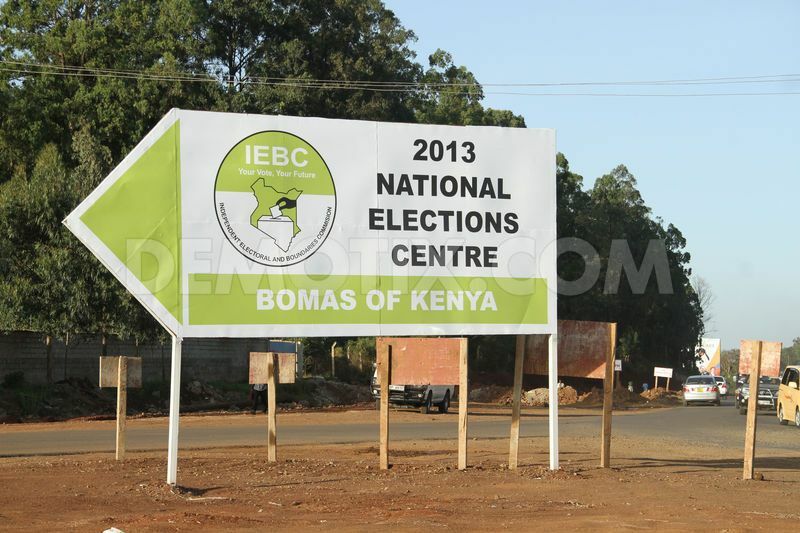 Throughout the week IEBC had warned media from declaring anyone the winner. However 30 minutes later KTN and NTV got a “nod” to call the elections. From there on events moved quickly. At 1.30am KTN flew a banner indicating Uhuru Kenyatta was the winner. Several stations in surprise followed suit. Kenyans would wake up on Saturday morning to all TVs proclaiming “President Uhuru”, almost 12 hrs before Isaack Hassan finally announced Uhuru’s win on Saturday afternoon. The Weekly Citizen in this exclusive report can now report stunning details of a rigging plot that would have passed undetected if all players had stuck to the script and the “tyranny of numbers” theory had not fallen flat on its face on March 4th. According to CORD insiders and several statistics analysts who have examined the IEBC voter register when it closed on Dec 18th, over 1,500,000 extra votes were “unexplained votes” votes that were for the presidential result alone. Since according to the IEBC, every voter was given 6 ballot papers, IEBC will be hard pressed on how this happened. If these allegations are proven then, Uhuru’s tally will render his 6,173,433 vote announced by the IEBC to 4,673, 433. Which could mean that Raila Odinga could have won the election if what CORD claims is true. The well calculated scheme was based on 3 critical things that had to be done to force in Uhuru. The most important was to force a first round win for Jubilee. Getting the numbers was an issue that had worried TNA strategists one year before striking an alliance with William Ruto’s URP as the Jubilee Coalition. Even if Ruto’s Kalenjin backyard was convinced to vote for Uhuru, the numbers Kalenjins brought in were still not enough. Though the “Tyranny of Numbers” propaganda was sold as a winning formula, insiders knew the truth held a different reality. The 50% was simply not there. The best Jubilee could manage was force a run-off their researchers said they would lose. “It is Funny that the tyranny of numbers theory perpetuated by Political Analyst Mutahi Ngunyi done in February 2013 mentions the same figures Uhuru got in the final tally” says popular blogger Robert Alai. Several contingency plans were made to ensure the plan succeeds. One was to ensure that the Kikuyu and Kalenjin voter turn-out was to hit 95% while hoping that CORD base’s turn-out would remain at the traditional 65% to 70%. Like many assumptions made by the Jubilee strategy team, their plan on turn-out was based on assumptions that CORD’s base would barely attain their traditional turnout. The second critical factor was use of technology to help add up numbers as the infamous tyranny of numbers depended on factors outside Jubilee’s control. This plan to be used was borrowed from Ghana’s December 2012 Presidential Elections. The election which is now being contested at the Ghanian Supreme Court was won by President John Mahama who was announced to have secured 50.7% of votes, enough to avoid a run-off against NPP candidate Nana Akufo-Addo with 47.7%. Akuf-Addo has filed a petition with evidence that the vote was won by manipulating the electronic system. In the Ghanian petition, proof has been revealed the company hired by the Ghanaian Election Commission to supply data services – SuperLock Technologies Ltd – also had a contract with the National Democratic Congress to supply the same services to the party that included tallying. In the petition NPP says it had found irregularities such as cases of over voting and instances when people not registered by the new biometric finger-printing system were able to vote. According to the NPP and the other parties, these numbers announced by the Ghana’s Electoral Commission did not correspond with actual votes recorded in the 275 constituencies. They allege tampering of numbers by the suppliers of IT services in favour of John Mahama. The commission also reported that turnout was at an all time high of 81%. Similar to the Ghanaian case, the company that supplied Kenya’s IEBC with the electronic data and call centre services is Ken Call. The company whose connection to IEBC were never made public was charged with supplying call centre services and hosting the data base from where the polling station results were remitted to the IEBC. Ken Call also has a contract with Uhuru Kenyatta’s The National Alliance party to supply tallying services of results from polling stations! “Results from Returning officers at polling stations being transmitted electronically were first relayed to Ken Call’s servers for onward transmission to Bomas”, an IEBC official told Weekly Citizen. The official says it is unclear when the company was hired by the IEBC and why the commission ignored the conflict of interest. Secondly, as Ghana’s NPP claims in their petition, the ruling party used Super Lock Technologies Ltd to hack into the system and pre-determine a mathematical formula that adjusts figures as they come for both candidates while keeping any other candidates at a predetermined formula to ensure they do not harm the intended outcome. (This possibly explains why Uhuru’s margins with Raila never changed even with random results coming from all over the country). Yet even with this plan, Jubilee knew they would have to top up “few” numbers based as the 50% + 1 was still proving elusive with a week to the election. The third and final strategy was the real plan. Play with Kenyans’ minds by manipulating results and establishing a lead for Jubilee then crash the system and go manual. This was arranged by declining to have a back-up server which would retain evidence of the manipulation. With only one server, a deliberate crash would be final and would destroy evidence. According to Maina Kiai, former chairman of the a human rights organization the technology was a red herring. “Even with this plan, the team knew they would have to top up numbers based as the 50% + 1 still proved elusive with a week to the election” says a TNA Mp Elect. While the scheme was to “minimally” add votes to the “tyrannical numbers” to enable a Round One win, everything went wrong on March 4th Election day as the electorate in key battle ground areas stunned Jubilee strategists with an anti Uhuru vote. Luhyas expected to vote for Musalia up to 50% rebelled and went for Raila. The 30% of the Kamba vote expected from Kitui through Charity Ngilu failed to come in. Coast where Jubilee were expecting a 50-50 share with CORD bolted to Raila. CORD and Raila took off with 70% of the Kisii vote. In Kalenjin land, voter turnout fell below 70%. The “tyranny of numbers” was becoming a flop. With predictions by Jubilee statisticians collapsing all over on Election Day, the team after consultations had to quickly switch to Plan B. As former Attorney General Amos Wako disclosed at a press conference last week “It appears the IEBC had several registers as they did not even gazette any. We will be asking the Supreme Court to examine which register was being used and which one was valid”. Other than manipulate the register using technology, technology was also becoming an obstacle to get the right numbers and ensure a Round 1 win. The Voter Identification Kit which required fingerprint identification for voters could not be manipulated as “ghost” voters could not get in to vote or double voters. They had to be physically present. By 2pm, a crisis meeting was convened by Jubilee strategists on how to shore up numbers in Rift Valley. Mysteriously the Finger Print Identification kit stopped working. Manual voting was introduced. The IEBC electronic tallying system which was relaying fast results with a 53% lead for Uhuru four hours after 5pm, suddenly slowed down with just a million votes in. Then the “IEBC” server which in reality belonged to Ken Call crashed. And the results slowed down to a trickle. By 11pm IEBC announced to the press that announcement of provisional results had been halted and pushed to Tuesday. Most IT experts confirm that the amount of data being remitted for the 33,000 polling stations in terms of text messages could not have crashed the system. “It is very little data. Safaricom, Airtel and Orange deal with almost 300 million text messages daily. The data from polling stations was not that much”, says an employee of Safaricom on condition of anonymity. “What is puzzling is why on such an important exercise IEBC and Ken Call did not install the standard back-up server which would saved remitted results and revived the process”. The CORD team believes Isaack Hassan’s explanations were a cover-up and that the technology “use” and “failure” were part of the strategy to rig the elections. “The electronic system kept Uhuru and Raila at particular percentages to psychologically make Kenyans believe Uhuru was winning and Raila was losing. However since the figures at Bomas were not matching forms 34, 35, 36, and the Jubilee “tyranny of numbers” formula had failed, the electronic tallying system had to go. With the plan in progress for manual voting, by Wednesday Rift Valley Turn-Out was being reported at 90% while Central had risen to 95%. Based on the Kriegler report this numbers were obviously inflated. However more was required as Uhuru had dropped below 50%. So delays had to be created for Returning Officers to re-adjust figures. The diversionary tactic kept Kenyans patient as Issack Hassan kept talking of delays caused by “verification”, “technological challenges” and introduced a phrase “complex elections” that would be repeatedly used throughout the Bomas process. With the announcement that manual voting would be used, the vote tallying took a different outlook as the initial 48 hrs in which all provisional results were to be announced dragged into days and tallying began afresh. Questions about discrepancies by CORD officials resulted in IEBC throwing them out. A compliant media was threatened into silence and no criticism of the IEBC was to be aired. The Bomas tallying centre was placed under heavy security as the once accessible Chairman of the IEBC now avoided all media questions regarding the process. “This is the most opaque electoral commission and ranks lower than even the late Kivuitu Commission” said one of CORD’s lawyers James Orengo. Wajir North had a 92% Voter Turn-Out for spot whose history indicates 50-60%. In Wajir West, if the Final Register hadn’t been adjusted, 99.45% of the Registered Voters would have voted. In Nyaki East in North Imenti with 12000 registered voters 15300 are reported to have voted! In Kajiado South, the people who voted (42,276) is higher than the people registered in Dec (41,040).Register adjusted to 46,218 to conform. In Sigor, the people who voted (19,704) is higher than the people registered in Dec (19,337).Register adjusted to 21,341 to conform. “How does Turkana Central with 25,970 votes as at 18th Dec end up with 34,486 voters after reconciliation?! Where did 8,516 voters come from?” asks Dr Makodingo, a political analyst on his twitter page. Worse still Worse still, IEBC’s figures refuse to add up inspite of efforts to “correct errors”. Valid Votes (12,222,980) plus Rejected Votes (108,975) add up to 12,331,955 and not their tally of 12,338,667!! Presently CORD may only have to prove that the 8,000 votes votes Uhuru received to add to his declared 50% is fraudulent. If that is done the Supreme Court can order a fresh poll within 60 days. CORD Propaganda and I can assure you that you have no credible case. You are right though,as a man you will go down fighting. lets leave the supreme courts to decide and at the end of it all the truth will come out may God bless all the judges of the supreme court and let them not be intimidated by any politicial the way IEBC officials were. The hitherto major proponent of majimbo (devolution) rift valley province, suddenly turned its back on devolvement/majimbo/vijimbo (county governments) !! No wonder, URP kept on hammering its being savvy digitalally. We can clearly see now what was behind that deceitful barrage !! from all the exhibits exposed if at ol they bind…then rigging took place….and cord won the elections! And numbers are made to favor they with the best connections? What does it matter if the vote in my hand is worth just but a melon? the jubilee government should be ashamed for themselves and they should know that they cannot lead Kenyans for more than 2 years bcoz the signs already shows that the have been defeated by the government. Raila and Kalonzo are the only people who can manage the lead this country. its my hope that if the two of them are summoned in the ICC they will never come back to Kenya.